The Island of Doctor Moreau is an 1896 science fiction novel by English author H. G. Wells. The text of the novel is the narration of Edward Prendick, a shipwrecked man rescued by a passing boat who is left on the island home of Doctor Moreau, a mad scientist who creates human-like hybrid beings from animals via vivisection. The novel deals with a number of philosophical themes, including pain and cruelty, moral responsibility, human identity, and human interference with nature. 2] Wells described it as "an exercise in youthful blasphemy." 3] The Island of Doctor Moreau is a classic of early science fiction 4] and remains one of Wells's best-known books. The novel is the earliest depiction of the science fiction motif "uplift" in which a more advanced race intervenes in the evolution of an animal species in order to bring the latter to a higher level of intelligence. It has been adapted to film and other media on many occasions. 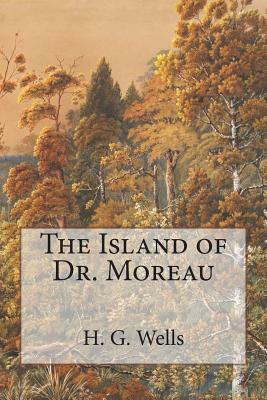 The Island of Doctor Moreau is the account of Edward Prendick, an Englishman with a scientific education who survives a shipwreck in the southern Pacific Ocean. A passing ship takes him aboard, and a man named Montgomery revives him. Prendick also meets a grotesque bestial native named M'ling, who appears to be Montgomery's manservant. The ship is transporting a number of animals which belong to Montgomery. As they approach the island, Montgomery's destination, the captain demands Prendick leave the ship with Montgomery. Montgomery explains that he will not be able to host Prendick on the island. Despite this, the captain leaves Prendick in a dinghy and sails away. Seeing that the captain has abandoned Prendick, Montgomery takes pity and rescues him. As ships rarely pass the island, Prendick will be housed in an outer room of an enclosed compound. The island belongs to Dr. Moreau. Prendick remembers that he has heard of Moreau, formerly an eminent physiologist in London whose gruesome experiments in vivisection had been publicly exposed and has fled England as a result of his exposure. The next day, Dr. Moreau begins working on a puma. Prendick gathers that Moreau is performing a painful experiment on the animal, and its anguished cries drive Prendick out into the jungle. While he wanders, he comes upon a group of people who seem human but have an unmistakable resemblance to swine. As he walks back to the enclosure, he suddenly realises he is being followed by a figure in the jungle. He panics and flees, and the figure gives chase. As his pursuer bears down on him, Prendick manages to stun him with a stone and observes the pursuer is a monstrous hybrid of animal and man. When Prendrick returns to the enclosure and questions Montgomery, Montgomery refuses to be open with him. After failing to get an explanation, Prendick finally gives in and takes a sleeping draught. Prendick awakes the next morning with the previous night's activities fresh in his mind. Seeing that the door to Dr. Moreau's operating room has been left unlocked, he walks in to find a humanoid form lying in bandages on the table before he is ejected by a shocked and angry Moreau. He believes that Dr. Moreau has been vivisecting humans and that he is the next test subject. He flees into the jungle where he meets an Ape-Man who takes him to a colony of similarly half-human/half-animal creatures. Their leader is a large grey thing named the Sayer of the Law who has him recite a strange litany called the Law that involves prohibitions against bestial behavior and praise for Dr. Moreau. Herbert George "H.G." Wells (21 September 1866 - 13 August 1946) was an English writer, now best known for his work in the science fiction genre. He was also a prolific writer in many other genres, including contemporary novels, history, politics, and social commentary, even writing textbooks and rules for war games. Wells is sometimes called The Father of Science Fiction, as are Jules Verne and Hugo Gernsback. His most notable science fiction works includeThe War of the Worlds, The Time Machine, The Invisible Man, and The Island of Doctor Moreau.